Sitting behind a tinted window in the control room, a trained instructor observes WSU College of Nursing students treating a patient. But this patient isn’t a living, breathing human being. 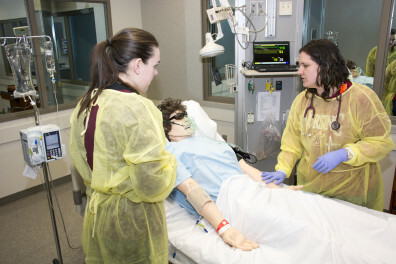 It’s a mannequin, and it gives nursing students an as-close-to-real experience as you can get in an academic setting. That mannequin can sweat, bleed, cry, have seizures and much more. It can basically act as any medical patient could. 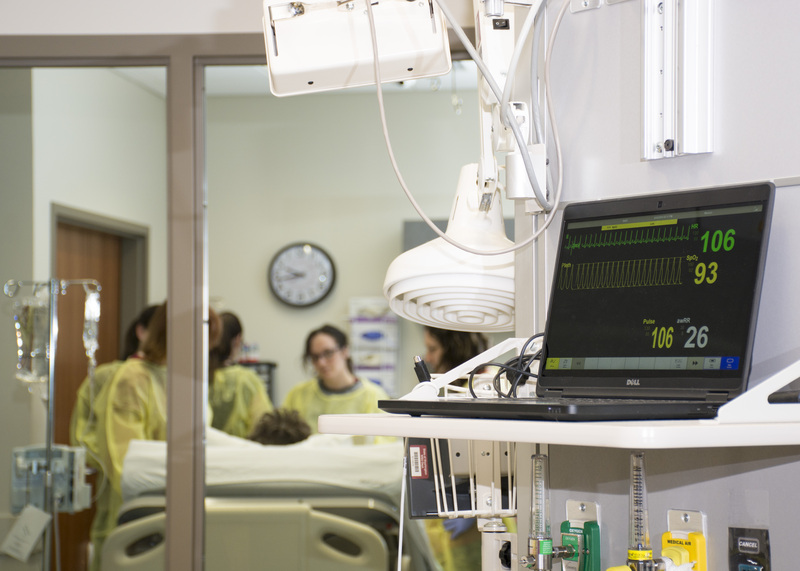 Kevin Stevens, Director, Program of Excellence in Clinical Performance and Simulation, College of Nursing, oversees all simulations in the undergraduate program as well as any at the graduate level. She helps ensure students are equally trained. “We run 33 groups through (in first semester of their junior year) and I want all of them to have the same exact experience,” she said. Simulations are scripted out and typically last about 20 minutes. Students go through simulations as part of their clinical courses. 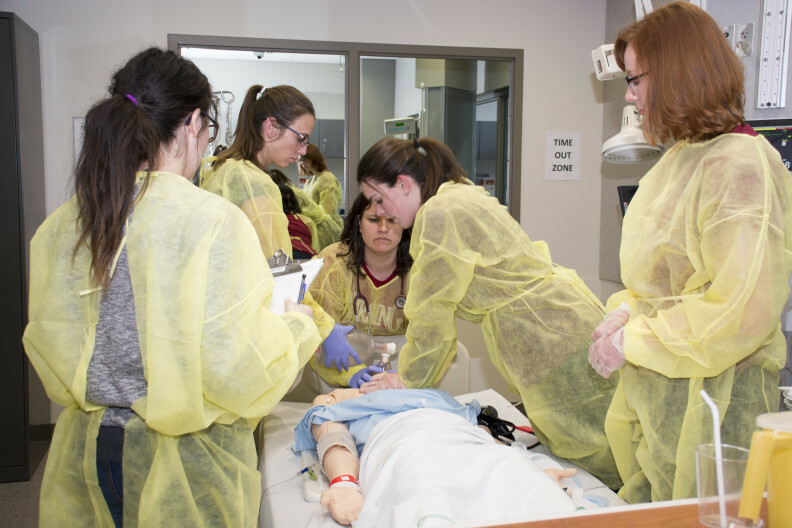 “All of our formal simulations that are embedded into our clinical courses are scripted out based on the objectives we want to meet in that particular course,” Stevens said. Stevens referenced formal simulations, and in 2009, informal simulations began when the Simulation Club formed. The club runs simulations in a semi-relaxed environment for students to gain experience. Senior nursing student Lauren Berglind got involved during her junior year. Berglind said when she goes to her clinical training at local health care providers, she only experiences what happens on that day with her patients. The simulation courses and the Simulation Club allow her to train for specific scenarios. “I want to know that’s the sound that I’m looking for when I’m out in practice so I don’t misdiagnose or mistreat someone,” she said. Simulation training paid off for nursing alum Ashley Ormsby, who experienced a traumatic event in her workplace and was able to recall the lessons she learned at WSU. Stevens has stories from other alums as well, proving that simulation training can help save lives. Stevens shared one story of some students who practiced handling codes during their simulation training. The next week at their clinical site, there was a code. The WSU students were given high marks for their performance by their mentors. “The comments from that provider in that code were ‘how did you know how to do CPR so well?’ and they told them they learned it in simulation last week,” Stevens said. When practicing codes during simulations, the students aren’t aware of what’s about to happen. Simulation codes progress as if it was real life. The patient could have an underlying issue that leads to a code. Stevens said the Simulation Club was student-driven and came about because students simply wanted more practice. The club is also interprofessional, and pharmacy and speech and hearing sciences students have been involved, too. Students take simulations seriously, too. Working with a mannequin isn’t real life, but students know they have entered a profession that often has to keep patients alive and well. Berglind said she once did everything wrong during one simulation during her junior year. “I felt awful….it just urged me on to practice more,” she said. When a simulation goes well, though, Berglind remains humble. “It’s a good feeling but it doesn’t stop me from continuing to learn that subject because you can always do better,” she said. After each simulation, there is always a debrief period in a separate room so students can discuss what went well and what needs improvement. Stevens said the debrief period is when students can “really figure it out” and reflect on their actions.